Bull Terriers were bred as a cross between Bulldogs and Terriers in the 19th century. Let's admit it, no other dog has such an unforgettable appearance as the Bull Terrier. Its most distinctive feature is the massive, oval-shaped head without a stop; it is almost flat at the top. The body is compact, sturdy, strong and muscular; the legs are relatively short. The triangular eyes are dark, small and piercing. The height of Bull Terriers is 15 to 22 inches, and they weigh 35 to 80 pounds. Bull Terriers are definitely not for novice owners. They require proper socialization at an early age, a lot of obedience training and exercise, and a firm owner to establish leadership. Those activities are very important because otherwise the dog can become too aggressive. If you are not experienced in having wilful dogs, or if you do not have time for the above-mentioned, it is better to choose another breed. 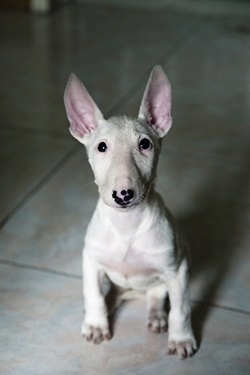 If thoroughly socialized and trained, Bull Terriers become wonderful and affectionate pets. They are courageous, fearless, active, loyal, intelligent, and somewhat clownish. They become very attached to their owners and can make excellent watchdogs. A Bull Terrier can defend its owner in a truly critical situation. Always walk the dog on leash unless there are no animals or other people around: Bull Terriers can be aggressive to smaller pets such as cats, rodents, birds, toy dogs, etc. It happens due to a strong prey instinct, so keeping them with other pets, especially dominant, aggressive, or assertive ones, is not generally recommended. Also, Bull Terriers hate to be teased and may bite in response, so even if they are great with children in your family (which is usually true with properly socialized dogs), they can easily be aggressive to other children. Bull Terriers are most recognizable by their oval head without a stop. Photo by © Jacek Smolak. Intact Bull Terriers do not get along well with other unaltered males. Bull Terriers tend to be very protective by nature. Do not encourage possessive and jealous behaviour. Sometimes a Bull Terrier can become quite destructive (biting and digging), but it usually happens when the dog feels lonely or bored and does not have enough toys, attention or other amusement. For this reason, Bull Terriers should not be left without supervision for a long time. Make sure to train your Bull Terrier not to nip and bite because its strong jaws can really hurt even if the dog thinks it is only playing. Dogs of this breed are highly motivated by food, toys, and positive reinforcement. Avoid punitive and repetitive training: working with a sense of fun will have much better results. Bull Terriers have a short, close-fitting coat easy to take care of: very little grooming is necessary. Average shedder. 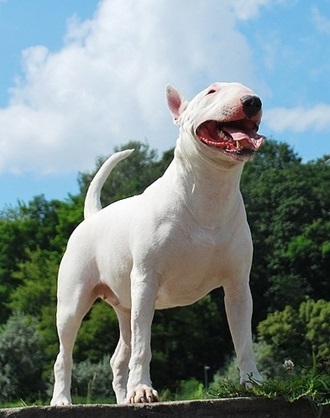 There are two varieties of the coat colour: White Bull Terriers and Coloured Bull Terriers. The first one is either totally white or white with some markings on the head (but not on the other parts of the body). Coloured Bull Terrier may be brindle, black-brindle, tricolor, red, or fawn with white markings. 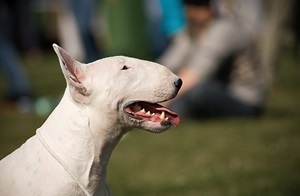 Bull Terriers can be sensitive to fleas and other parasites. Sometimes these dogs can suffer from heart defects, kidney failure, luxating patella (dislocation of the knee-cap), and skin allergies. Ask the breeder about possible diseases in the line. Also, check puppies for deafness. The lifespan of Bull Terriers is 10 to 12 years. Read also: Miniature Bull Terrier.